Bedford’s Steven Ressler, 5, dribbles down the court while Chestnut Ridge’s Matt Whysong, 23, defends. Also in the photo in the back (from left) is Chestnut Ridge’s Noah Hillegass, Bedford’s Dylan Arnold, and Chestnut Ridge’s Kamden Clapper. Bedford's Jace Growden records a steal for the Bisons during Thursday's 64-47 victory over Chestnut Ridge. Chestnut Ridge’s Noah Hillegass, 44, collides with Bedford’s Jace Growden, 0, during the second half, Thursday. Bedford’s Drew Hall, 32, goes in for points as Chestnut Ridge’s Noah Hillegass defends the Bison during Thursday’s LHAC contest. Bedford's Steven Ressler, 5, drives to the basket while Chestnut Ridge's Noah Hillegass guards him during the first half, Thursday. Bedford coach Leo Brunelli said after Thursday’s 64-47 victory over Chestnut Ridge that any night in the Laurel Highlands can be a dog fight. That’s one way to describe the game between the two county foes. After facing one another in the final at the Claysburg-Kimmel Holiday Tournament on Saturday, a 61-50 Bedford win, the two were well aware what each had to offer. Although tied at the end of the opening period, the Bisons took a seven-point lead into the half. In the opening period, Bedford opened with a five-point run, but the Lions answered with 12 unanswered points. During the Lions’ stretch, Noah Hillegass scored the first five points, Isaac Little added a three, Shane Felix a pair of free throws, and Hillegass closed things out with a bucket. The two teams exchanged baskets, with Little’s three putting the Lions ahead, 15-7, but the Bisons tied the score with an eight-point rally. Steven Ressler had six of those eight points. Following a putback by the Lions, Bedford’s Drew Hall single handily put the Bisons ahead of their county foes, 26-17. Hall had three three-pointers and a lay-up during the 11-point. Nether team strung together another scoring stretch as the first half came to a close as the Bisons led the Lions, 31-24. Despite woes at the free throw line, the Bisons maintained substantial lead throughout the second half. The Bisons finished the game 17 for 30 at the line, while Ridge was only five for six. Following a lay-up by Little, Ressler and Hall strung together a five-point run that was broken up by CR’s Shane Felix’s three points. Ridge had a run of four before Bedford anchored a 10-point run followed by the Lions’ streak of five points. Ressler scored twice on lay-ups, while Jace Growden had a basket and a pair of free throws. During the stretch, Bedford was four for eight from the line. Logan Pfister ended the Bisons’ rally with a three, while Felix followed up with a steal that resulted in a lay-up. 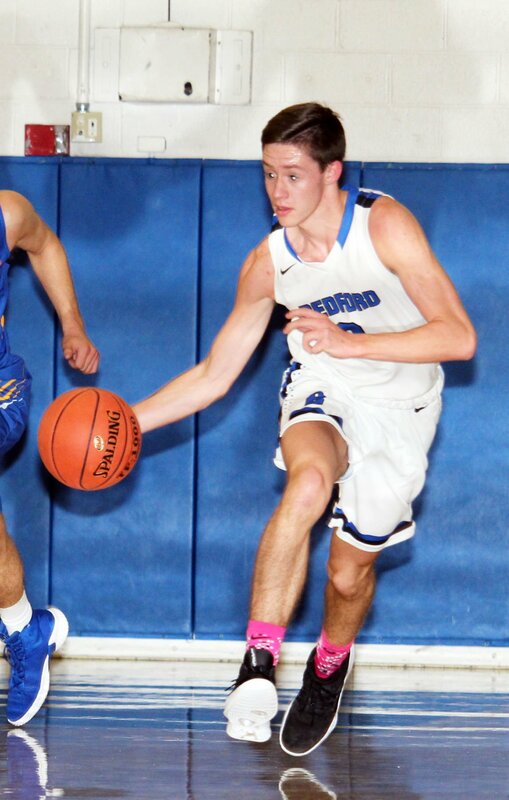 Bedford began a five-point run as the third quarter came to a close, opening the final period with a three by Hall, putting the hosts ahead, 53-38. Hall answered Felix’s free throw with a lay-up and after a Pfister lay-up, Hall countered with a lay-up of his own. Hillegass and Little sandwiched three-pointers around a six-point run by Bedford, and after a free throw by Miles Washington the Bisons solidified their 63-47 victory. Hall led the Bisons with 27 points, while Ressler wasn’t too far behind with 23. Growden chipped in 10. For Ridge, Hillegass finished with 12 and Little had 11. Both teams are back in action on Friday. Bedford, 6-3, hosts Richland, while Chestnut Ridge, 1-7, hosts Forest Hills. Chestnut Ridge (47) — Isaac Little (3) 1 0-0 11; Matt Whysong (1) 1 1-2 6; Shane Felix 3 3-3 9; Logan Pfister (1) 2 0-0 7; Noah Hillegass (1) 4 1-1 12; Kam Clapper 1 0-0 2; Ethan Whysong 0 0-0 0; Jonah Hillegass 0 0-0 0; Luke Mickle 0 0-0 0. Totals: (6) 12 5-6 47. Bedford (64) — Jace Growden 3 4-4 10; Miles Washingtn 0 2-6 2; Steven Ressler (1) 7 6-6 23; Dylan Arnold 0 2-2 2; Zach Vent 0 0-0 0; Joey Koontz 0 0-0 0; Spencer Ebersole 0 0-0 0; Drew Hall (6) 3 3-12 27; Mercury Swaim 0 0-0 0; Brett Wilson 0 0-0 0. Totals: (7) 13 17-30 64. JV — Chestnut Ridge, 45-34. High Scorers — CR: J. Hillegass, 12; B: Koontz, 14.